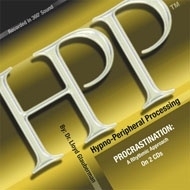 Procrastination utilizes Dr. Lloyd Glauberman�s revolutionary HPP method to program your unconscious mind to organize and energize your experience so that you begin to initiate important tasks in your life. This method allows you to bypass self-sabotage, insecurity, and procrastination while providing you with a more positive attitude about getting things both started and finished. You will find yourself able to stay motivated and disciplined while developing a more positive self-image � instinctively and intuitively taking the right steps to accomplish your goals. Procrastination: A Rhythmic Approach will give you the tools you need to accomplish your goals in life. A classic. It made a difference. I notice I get things done instead of putting them off. It is obviously an old audio, because it refers to cassette tapes! But the HPP works well, despite the reference to old technology! Thumbs Up! Very efficient. I work more, finish what I've started without effort and...enjoy it! HPP is a constant help on all my areas of focus. After a week of solid use, I find myself handling what needs to get done with greater focus, clarity and joy. I think Dr. Glauberman's stories are brilliant!. After 10 days, I absolutely know it’s begun setting me free from the ball & chain of a deeply entrenched pattern of destructive behaviour. I’ve literally prayed for help to break free of chronic procrastination and divine intervention led me to this product.